Location: 5km from Fardapur, 99km northeast of Aurangabad, Northern Maharashtra. Open: All year Tue-Sun 9-17:30 or sunset, whichever is earlier. Fee: Fee for Caves No 1, 2, 16 and 17: Foreigners: Adults USD 5, Children (0-15) free. Indians: Adults Rs 10, Children (0-15) free. Lighting Rs 5, Photography Rs 5, Video Camera Rs 5. Flash photography is strictly forbidden in this caves. This is a re-print and no date is given as to the original edition, probably 1920. The author gives his interpretations of the various painting along with a fascinating travelogue. Not the usual "Kilroy was here", more of "Glory to Buddha". A scholarly work showing an interesting insight into early Indian alphabets. Written for the lay reader, it will be of great help in understanding the cave temples. 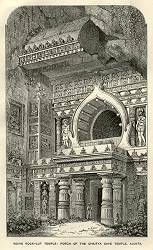 J Griffiths (1983): The Paintings In The Buddhist Cave Temples Of Ajanta, Khandesh, India. Vol 1 (Pictorial Subjects) 40 pp 91 plates some in colour. These are two enormous tome 29 x 44 cm and 3 cm thick. It would appear, through this is not stated that these are reprints of an 1896 edition. The author is a distinguished artist critic, former Principal of the Bombay School of Art etc. He was very fortunate to be able to visit and copy these paintings whilst they were still relatively unharmed. He claims that no European could possibly copy these paintings successfully and so he trained some natives to make drawings which would capture the sprit of the originals. Bewitching, seductive, alluring. Need I say more? 200 BC to 650 AD caves were excavated and decorated. 1819 Re-discovered by a British hunting party. 1920-1922 paintings restored by Italian art experts. 1983 listed on the UNESCO World Heritage List. 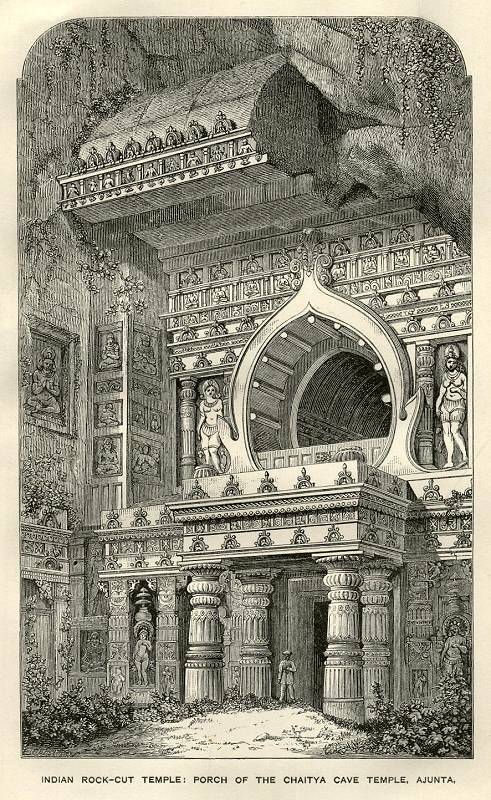 Image: old engraving of Ajanta. The Ajanta Caves are older than Ellora, so it makes sense to visit these first. The Ajanta Caves are Buddhist and are famous for their magnificent paintings. The 29 caves are cut into the steep face of a rock gorge. Many of the caves are dark, so it is worth paying the extra for a lighting ticket. Five of the caves are chaityas or temples while the other 24 are viharas or monasteries. Caves 8, 9, 10, 12, and 13 are of the simpler, more austere and older Hinayana school where the Buddha was never directly represented but always alluded to by a symbol such as a footprint or wheel of law. All the others are of the Mahayana school and contain some very elaborate carvings. Cave No 1 has a huge Buddha statue, and some notable paintings including the black princes and the dying princess. Avoid at all costs weekends and public holidays, it is bedlam and makes the Calcutta rush hour look like a picnic. Lighting: Many of the caves are very dark and a torch is useful. Search Google for "Ajanta Caves"